Overall, local partners tested more than 1,500 water samples, resulting in the replacement of 26 of 294 (9%) fixtures. Additionally, we identified and replaced two lead service lines – the lead pipe connecting the main under the street to buildings – at facilities in Chicago and a suburb of Cincinnati. While more than three out of four water samples had lead levels below 1 ppb, seven of the 11 facilities had at least one drinking water sample above EDF’s health-based benchmark for action of 3.8 ppb (see figure below). Two of these facilities had at least one sample above 80 ppb of lead: 16 times higher than the lead level allowed in bottled water. Replacing fixtures generally was effective, however, we could not always reduce lead levels below 3.8 ppb, likely due to an inadequate NSF International standard allowing new brass fixtures to leach up to 5 ppb of lead. To succeed in testing and remediating lead in water, child care facility operators, state licensing agencies, and health departments will need support from EPA, water utilities, and NSF International, as well as the families they serve. The report provides recommendations for each of these critical audiences. 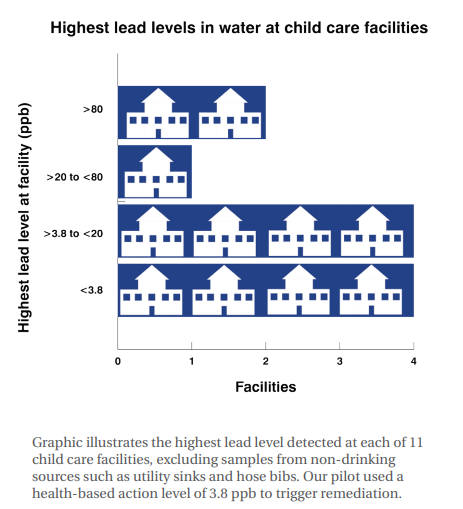 Though child care facilities are currently a major gap in the effort to reduce children’s exposure to lead from drinking water, they also present a critical opportunity for renewed progress in the future. Get the full details on the report here. This entry was posted in Drinking Water, Emerging Testing Methods, EPA, Health Policy, Health Science, lead, Public Health, Regulation, States and tagged child care, lead, Lead Exposure, Lead in Drinking Water. Bookmark the permalink. Both comments and trackbacks are currently closed.